Sunday Sis and I headed back to Hampton from Mom's house in east Tennessee. 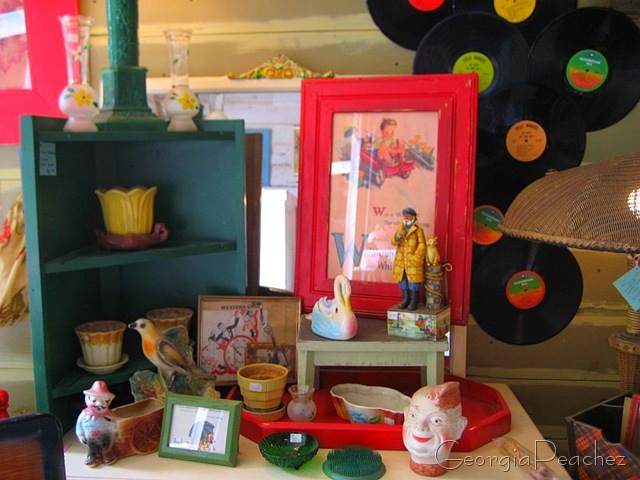 We decided to take the North Carolina route and take a bit of a detour over to Raleigh so that we could stop in and pay a visit to a fabulous store, Suzanna's. Today minding the store was Susie assisted by her lovely daughters. This store is very artfully arranged eye candy. Did ya enjoy that, I sure did. Well worth the detour. Great shopping and great hospitality! These ladies do it up right. Oh gosh what a treasure trove, and what a worth while detour!! 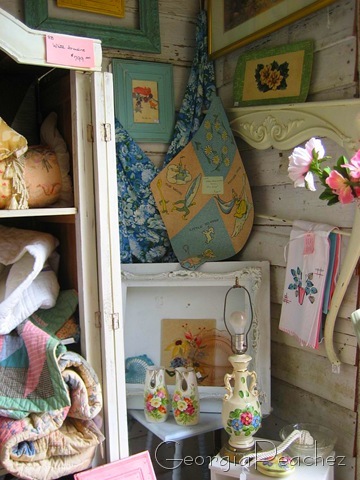 I have furnished almost my intire home with the lovely items from Suzanna’s. It is such a special place! Oooohh! What a wonderful store! I think I’d go nuts in there. Definitely my kind of place. I remember those bright chairs in the last photo from my childhood. And in the top photo, it sort of reminded me of a little scene a child would create while playing. But if it was my four year old grandson, it sure wouldn’t stay that neat very long! What a small world! I have a booth there:) I found out about your blog somehow- I’m not even sure… And then I see you post about something in my neck of the woods! 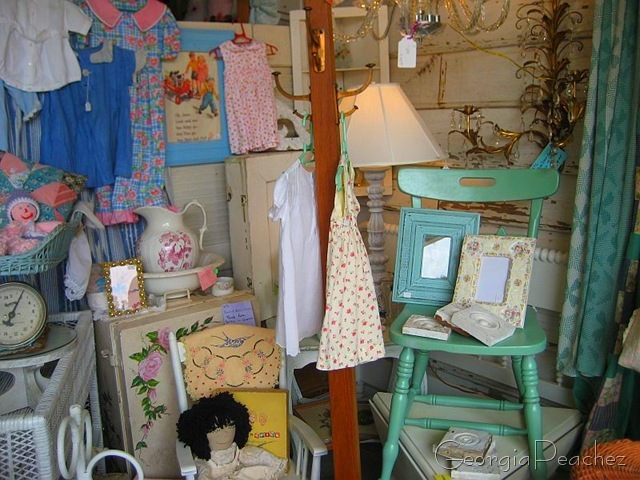 The next time you’re in Raleigh, check out Gresham Lake Antique Mall which is right near there – Only about 2 minutes down Capital Blvd. What cute pictures! Fab detour for a Tuesday! I could go into some serious debt in that store! Super Shop!! What? No purchases? 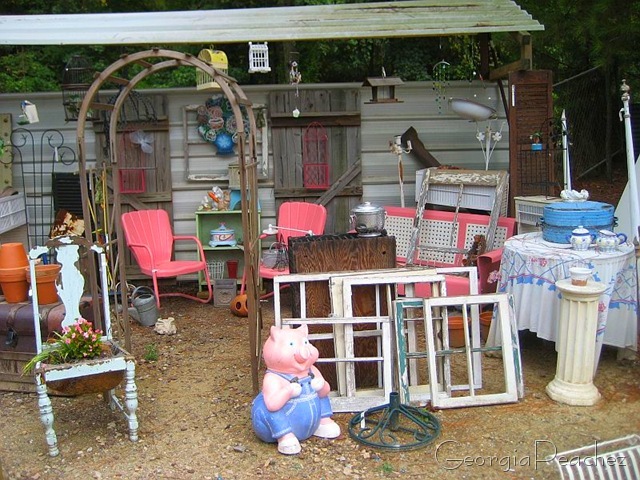 I personally like that Big Pig….my mom has my big ceramic pig bank that we got at the pottery factory in Williamsburg back in the late 70’s! OMGosh–I want to live there!! What a fantastic shop. What a great little shop! Suzie…..I love you Blog! Congrats on being featured!